Ryan Schierling: It's enough to make a man blush (or, the power of positive press). It's enough to make a man blush (or, the power of positive press). "Local band Spanish for 100 is celebrating the release of their third record, Jezebel, tonight at the High Dive. Don't be fooled by the Merle Haggard, Fugazi and Uriah Heap references peppering their MySpace page; this is celestial-minded, agit-pop with an Americana undercurrent...not that this is a bad thing (though if anyone could sound like Fugazi, Uriah Heap and Haggard all at the same time, I'd be hella impressed). Reliably rambunctious classic rockers Shim are also on the bill, and cover charge will set you back a mere $7. Strangely enough, the primary reason this show is on my radar is because of my current obsession with photographer Ryan Schierling's visual documentation of the band's 2007 and 2008 summer tours. 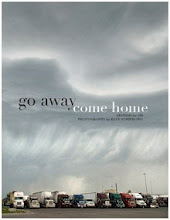 Go Away, Come Home is quite possibly the most uniquely moving collection of photographs I've ever seen of a band on the road. Schierling's eye is extraordinary in its affection for seemingly mundane details (how he makes a pickle on a truck stop diner plate utterly compelling is far beyond the grasp of my corpus callosum). The images, like the one above of Spanish For 100 guitarist Aaron Starkey and vocalist Corey Passons sitting outside a Wichita, Kansas laundry mat, are terribly romantic without feeling contrived. Sadly, Schierling is leaving Seattle for the sunnier pastures of Austin, Texas, but he's making Spanish For 100's record release his final Seattle rock show before he ditches us. Come down and tell him how awesome he is – or at least pick up your own copy of Go Away over here."